PAYING SUBSCRIBERS EARN CONTINUING EDUCATION CREDITS PER YEAR! Introducing Damon Q2, featuring 2x* rotation control for optimal precision, predictability, and efficiency. Treat all cases with the utmost confidence and bracket reliability** for the best possible smile result. Now available in standard and variable torque. NEW To learn more, contact your Ormco representative at 800.854.1741. +2x U3-3 compared to original DQ bracket. **Compared to other Damon Systems. Internal data on file. to move into a finishing wire after just two archwires. The patented laser treatment programs SmartArch to deliver the ideal force to each tooth. © FMC 2019. All rights reserved. The publisher’s written consent must be obtained before any part of this publication may be reproduced in any form whatsoever, including photocopies and information retrieval systems. While every care has been taken in the preparation of this magazine, the publisher cannot be held responsible for the accuracy of the information printed herein, or in any consequence arising from it. The views expressed herein are those of the author(s) and not necessarily the opinion of either Orthodontic Practice US or the publisher. acceledent.com © 2019 OrthoAccel Technologies, Inc. 1 Based on doctor testimonials on file. 2 Based on company-sponsored, randomized-controlled, blinded clinical trials. One study results showed the AcceleDent group was significantly faster than the sham control group in moving teeth in the ITT and PP groups by 50% (p=0.0496) and 38% (p=0.0234), respectively. Gakunga, P., Anthony, R. OA-02 Effect of Cyclic Loading (Vibration) on Orthodontic Tooth Movement. 2011. Unpublished study used for FDA clearance. Another study ITT analysis showed an average monthly rate of tooth movement in the AcceleDent group was 1.16 mm/month (95% CI: 0.86-1.46; 48.1 ± 7.1% faster) compared to 0.79 mm/month (95% CI: 0.49-1.09) in the control group, with a mean difference of 0.37 mm/month (95% CI: 0.07-0.81, P = 0.05), while the PP analysis showed significantly faster movement of the retracting cuspids when vibration was applied (P = 0.02). Typodonts with mounted mini screws and bonded brackets were used during this study for measuring error relating to tooth movement. Pavlin, D., Anthony, R., Raj, V., Gakunga, P.T. Cyclic loading (vibration) accelerates tooth movement in orthodontic patients: a double-blind, randomized controlled trial. Semin Orthod. 2015;21:187–194. 3 Accelerated tooth movement does not necessarily correlate to shorter duration of treatment. Individual results may vary. 4 Based on a randomized, controlled and parallel group clinical trial conducted during a four-month period. Because of possible unwanted treatment effects of bite wafers on pain reporting, the authors chose not to use a sham device that may have a bite wafer effect. Therefore, this study cannot dismiss the possibility that a placebo effect from AcceleDent may have influenced the results. Lobre, W.D., Callegari, B.J., Gardner, G., Marh, C.M., Bush, A.C., and Dunn, W.J. Pain Control in Orthodontics Using a Micropulse Vibration Device: A Randomized Clinical Trial. The Angle Orthodontist, 2015. 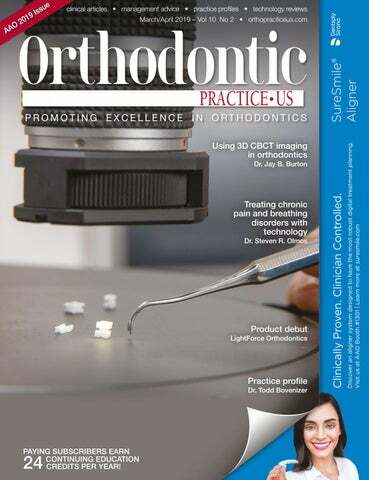 ON THE COVER Cover photo courtesy of LightForce Orthodontics. Article begins on page 30. FRI FAMILY VACATION #3 ARUBA! Would you rather see more patients ($) or enjoy extra vacation days (¥)? ™ Propel's Excellerator ® Series and VPro Series devices give you the tools to increase clinical accuracy, reduce treatment times and improve the ortho experience for your practice and patients*. Not to mention more flexibility in your schedule to do what matters most to you. be near impossible to try and compete. My father, however, is an extremely hard worker and didn’t let this intimidate him. He stayed the course, and the pharmacy is still doing well today. I credit my love for small business to his success and my family’s legacy in pharmaceuticals. Because of this, I knew that I wanted to own and start a business someday. Why did you decide to focus on orthodontics? I have always had an interest in science and pursued a science degree at Virginia Tech. I went into my senior year of undergrad trying to decide which degree path I should take, and my mother suggested dental school. At first, I thought she was crazy! I fought it but decided to take the DAT, and the rest was history. Carestream Dental systems give you a fast, safe and efficient orthodontic workflow When every piece in the chain is designed to work together, your workflow, practice and patients all benefit. Carestream Dental’s digital systems combined with CS OrthoTrac software offer numerous options for diagnosis, treatment planning and consultations—giving you the tools necessary to transform patient care and the way you present treatment options and goals. © 2019 Carestream Dental LLC. 18412 OR IN AD 0319 OrthoTrac is a trademark of Carestream Dental Technology Topco Limited. PRACTICE PROFILE orthodontics, however, surfaced in my third year of dental school. I loved the transformations that were occurring over time and the detail of work that was involved. I also loved the vibe that came from the residents — they were always happy, self-motivated, and enthusiastic. At that point, my spark was ignited, and I am still passionate about helping people achieve the smile they have always been after. How long have you been practicing, and what systems do you use? I have been in private practice at Bovenizer & Baker Orthodontics in Cary, North Carolina, for 13 years. I started using the Damon™ System in 2009, and since then, have used the system exclusively as a fixed appliance. I’ve enjoyed seeing its evolution over the past several years. The Damon System’s low-friction, passive self-ligating brackets, and minimally invasive treatment options have been valuable to the success of my practice — and patient satisfaction. We also use various clear aligner options for those not interested in fixed appliances. temporary anchorage devices, and as I mentioned earlier, the Damon System. be where I am today without the support of my wife, Megan. Professionally, what are you most proud of? This is a difficult question to answer. Certainly, I am proud of a lot of things; however, I believe an overinflated sense of pride can taint an individual or organization. I really think it is the authenticity that I place into my practice. I am always seeking to improve myself from a professional and a personal standpoint. Although I am confident, I try to possess a quality of humility in everything I do. What do you think is unique about your practice? My team is the most unique part of my practice. We have 21 team members who give it their all every single day. We are blessed with a great, hardworking, and supportive team. We also have one location and two doctors. Both Dr. Christopher Baker and I pour our lives into the office each day. Your expertise. Our technology. A powerful combination. It takes insight and skilled hands to turn technology into a powerful tool. When you use the Invisalign® system and an iTero® scanner to create amazing smiles, that’s exactly what you do. With more than 6 million* cases and counting, the mission is clear: Let’s do amazing things together. Visit us at Booth #2001 during the 2019 AAO Annual Session. PRACTICE PROFILE always myself. I am the one who becomes stubborn and complacent at times. Or often I need to look in the mirror and recognize that there are limitations but to never rest on getting better and striving for excellence. What would you have become if you had not become a dentist? I really believe with all my heart that God placed me in the field of orthodontics. I am exactly where I need to be. If I had to pick one, I would have been a landscape architect on a farm. I love plants and trees. It is a lot like orthodontics, with very meticulous cultivation of soil and watching the product grow. What is the future of orthodontics and dentistry? I think our profession is very cyclical. Now, with that said, things are changing, and practices must adapt. We now have a digital platform on which to practice — we scan and print 3D models. Practices are using more clear aligner therapy options as well. I believe that there will always be room for orthodontic practices that are striving to provide high-end and quality treatment for their patients. The number one piece of advice for maintaining a successful practice is honesty. Honesty with patients, staff, and everyone in between can help build up your reputation. Remembering that each person on your team is valuable and treating him/her with respect is important in creating a prosperous work environment. In terms of orthodontic treatment, I recommend practices using Phase I sparingly. This is because in many cases, dental correction achieved in Phase I may have to be corrected again in Phase II. To prevent this, I advise allowing all teeth to erupt into the oral cavity prior to beginning orthodontic care. peers, which is the key to leadership development and reputation establishment. midlines, and Class I canine and molar occlusion bilaterally. Radiographs showed root parallelism between the teeth adjacent to the extraction site. The case report describes the biomechanics behind ClinCheck® (Invisalign®) development for extraction cases treated with clear aligner therapy. We demonstrate that our approach toward extraction therapy produced a stable, functionally, and esthetically balanced occlusion for the patient. George J. Cisneros, DMD, received his dental degree from the University of Pennsylvania School of Dental Medicine and earned specialty certification in both Pediatric Dentistry and Orthodontics, as well as, a Master of Medical Science degree (MMSC) in Oral Biology at Boston’s Children’s Hospital Medical Center, the Forsyth Dental Center, and the Harvard School of Dental Medicine, respectively. Dr. Cisneros developed and established postgraduate training programs in Orthodontics at Albert Einstein College of Medicine/Montefiore Medical Center and Saint Barnabas Hospital in New York, and served as Chair of Orthodontics at New York University College of Dentistry. He is a Diplomate of the American Board of Pediatric Dentistry and the American Board of Orthodontics and has served as an ABO board examiner and on the ABPD Advisory Committee. He also was elected to and served on the American Academy of Pediatric Dentistry Board of Trustees. successful treatment with Invisalign in single mandibular incisor extraction cases,3,4,5 symmetrical two or four premolar extraction cases,6,7,8 and cases involving orthognathic surgery complemented with clear aligner therapy.9 A recent randomized clinical trial has shown similar objective grading system scores between Invisalign and fixed appliances in the treatment of Class I adult extraction cases.10 Despite such advances, there remains a great degree of uncertainty regarding the effectiveness of the Invisalign appliance in complex malocclusions, particularly those requiring extractions.11,12,13 Certain extraction patterns, such as unilateral patterns for dental or skeletal asymmetries, require particularly judicious space management and have not been illustrated in previous studies.14 In light of the lack of evidence on Invisalign-treated complex malocclusions in the current literature, we present the following case report to demonstrate the effective management with Invisalign therapy of a case where atypical extractions are indicated. Anderson T. Huang, BDS, DDS.ABO, FACD, FICD, is a faculty member, Department of Orthodontics, New York University College of Dentistry, New York City, and Department of Orthodontics, Taipei Medical University, Taipei, Taiwan. Dr. Huang is a Diplomate of American Board of Orthodontics (ABO). He is an Invisalign top 1% Platinum Plus provider and treating a wide range of orthodontic cases with clear aligner therapy, including Invisalign®, 3M™ Clarity™ aligners and SureSmile® aligners. He has orthodontic practices in Flushing, Great Neck, and Manhattan, New York. Dr. Anderson Huang was recently appointed as a board examiner of American Board of Orthodontics (ABO). Darren Huang, BS, DDS, is a postgraduate orthodontic resident, New York University College of Dentistry. He will join Dr. Anderson T. Huang’s practices in the summer of 2019. He has co-authored numerous articles with Dr. Anderson Huang during his tenure in the DDS program and postgraduate orthodontic residency. Disclosure: The authors, their opinions, and their research have not been endorsed by the companies mentioned in the article or any other organization that provides clear aligner therapy. The future of teen and preteen orthodontics is here. Introducing InvisalignÂŽ treatment with mandibular advancement and Invisalign First clear aligners. Clinically proven outcomes and a treatment experience you and your growing patients will appreciate. Learn more at Invisalign.com/treatingteens Visit us at AAO Booth #2001 MKT-0002911 Rev A ÂŠ 2019 Align Technology. All Rights Reserved. CASE STUDY crowding, while the mandibular arch showed 5 mm of crowding. The maxillary left canine had ectopically erupted, leading to a maxillary midline deviation to the left of about 3 mm. Initial cephalometric analysis showed a Class I skeletal pattern, hyperdivergence, flared maxillary incisors, mandibular incisor inclination within normal range, and less than normal overjet and overbite as shown in Figure 2. The initial panoramic radiograph showed the ectopic eruption of the maxillary left canine and erupting third molars in all four quadrants (Figure 3). We treatment planned for the extraction of the maxillary right first premolar to facilitate maxillary midline correction and the eruption of the maxillary left canine. We also planned for interproximal reduction in the mandibular arch to allow for decrowding and midline coordination. Treatment Objectives Our central treatment objective was to create space for the eruption of the maxillary left canine. Other treatment objectives included coordinating maxillary and mandibular midlines, creating ideal overjet and overbite, correcting maxillary and mandibular crowding, establishing Class I canines, improving maxillary incisor inclination, and creating balanced facial esthetics. ClinCheck design Our ClinCheck plan involved an initial course of 35 aligners and a refinement course of 16 additional aligners for a total treatment time of 26 months (Figure 4). We planned for the extraction of the maxillary right first premolar to facilitate the movement of the maxillary midline to the right. We incorporated a gable bend in the extraction space between the maxillary right second premolar and maxillary right canine to optimize root parallelism during space closure. About 1 mm of distalization was planned in the maxillary left segment to create additional space for the maxillary left canine. We requested that the aligners not cover the maxillary left canine, so we could employ auxiliaries to extrude the tooth into the arch during the initial course. In the mandibular arch, we planned for a total of 3 mm of interproximal reduction from the distal of the mandibular right second premolar to the distal of the mandibular left canine. We incorporated a button cutout on the mandibular left first premolar for the future placement of an auxiliary to assist in the extrusion of the maxillary left canine. Class II precision cuts were applied to counteract side effects from distalization on the left side and facilitate maxillary right canine retraction. © 3M 2019. All rights reserved. 3M, APC and Clarity are trademarks of 3M. Used under license in Canada. Available precoated with 3M™ APC™ Flash-Free Adhesive for superior bonding efficiency and confidence. During the course of treatment, we bonded metal buttons on the maxillary left canine when there was sufficient crown area and on the mandibular left first premolar, and we instructed the patient to wear vertical elastics full-time to facilitate extrusion of the maxillary left canine (Figure 5). Treatment progress and refinement Following the initial course of aligners, the maxillary and mandibular midlines were markedly improved. The space for the maxillary left canine was adequately prepared. However, the maxillary left canine erupted rotated distolabially and required further extrusion for ideal placement into the arch. In the refinement course, we completed the extrusion of the maxillary left canine and perfected the interdigitation of teeth in the posterior segments (Figure 6). Interproximal reduction was performed mesial and distal to the maxillary left canine and mandibular left first premolar to achieve extrusion of both teeth and ideal interdigitation. The panoramic radiograph showed optimal root parallelism between the teeth adjacent to the extraction site (Figure 9). The retention protocol required the patient to wear maxillary and mandibular Essix retainers 14 hours per day for the first year. At 1 year after debonding, the occlusion showed stability (Figure 10). Maxillary and mandibular alignment were maintained, overbite and overjet were stable, and maxillary and mandibular arch forms were preserved. Looks Great All Day, Works All Night Only OrthocapsÂŽ offers TwinAlignerÂŽ technology, delivering a day tray that is aesthetic, discreet and gentle, while a more rigid night tray provides for stronger correction. Learn more at orthocaps.com. canine into the arch. The timing for the addition of the auxiliary can be decided on the basis of tracking for the tooth in question. We have observed that significant extrusion — i.e., 3 mm or greater — often requires an additional refinement course to perfect interdigitation. Total treatment time for the case above was comparable to that which would be necessary had the case been treated with conventional fixed appliances. This result is coincident with the finding of Gu, et al., that on average, Invisalign patients finished 5.7 months faster when compared to matched patients in fixed appliances.17 In refinement courses, we routinely shorten the wear time for each aligner from 2 weeks to 1 week because typically less tooth movement is performed within each aligner. REFERENCES 1. Boyd RL. Esthetic orthodontic treatment using the Invisalign appliance for moderate to complex malocclusions. J Dent Educ. 2008;72(8):948-967. 2. Simon M, Keilig L, Schwarze J, Jung BA, Bourauel, C. Treatment outcome and efficacy of an aligner technique — regarding incisor torque, premolar derotation, and molar distalization. BMC Oral Health. 2014;14:68. 3. Zawawi, KH. Orthodontic Treatment of a mandibular incisor extraction case with Invisalign. Case Rep Dent. 2014;2014:657. 4. Giancotti, A, Garino, F, Mampieri G. Lower incisor extraction treatment with the Invisalign® technique: three case reports. J Orthod. 2015;42(1):33-44. 5. Needham R, Waring DT, Malik, OH. Invisalign treatment of Class III malocclusion with lower-incisor extraction. J Clin Orthod. 2015;49(7):429-441. 6. Womack, WR. Four-premolar extraction treatment with Invisalign. J Clin Orthod. 2006;40(8):493-500. 7. Honn M, Göz, G. A premolar extraction case using the Invisalign system. J Orofac Orthop. 2006;67(5):385-394. 8. Giancotti A, Greco M, Mampieri, G. Extraction treatment using Invisalign Technique. Prog Orthod. 2006;7(1):32-43. 9. Boyd RL. Surgical-orthodontic treatment of two skeletal Class III patients with Invisalign and fixed appliances. J Clin Orthod. 2005;39(4):245-258. 10. Li W, Wang S, Zhang Y. The effectiveness of the Invisalign appliance in extraction cases using the ABO model grading system: a multicenter randomized controlled trial. Int J Clin Exp Med. 2015;8(5):8276-8282. 11. Phan X, Ling PH. Clinical limitations of Invisalign. J Can Dent Assoc. 2007;73(3):263-266. 12. Lagravere MO, Flores-Mir C. The treatment effects of Invisalign orthodontic aligners: a systematic review. J Am Dent Assoc. 2005;136(2):1724-1729. 13. Ko HC, Liu W, Hou D, et al. Recommendations for clear aligner therapy using digital or plaster study casts. Prog Orthod. 2018;19(1):22. 14. Djeu G, Shelton C, Maganzini A. Outcome assessment of Invisalign and traditional orthodontic treatment compared with the American Board of Orthodontics objective grading system. Am J. Orthod. Dentofacial Orthop. 2005;28(3):292-298. 15. Huang AT, Huang D. Space management with Invisalign for interdisciplinary orthodontic treatment. J Clin Orthod. 2018;52(4):219-226. 16. Rossini G, Parrini S, Castroflorio T, Deregibus A, Debernardi CL. Efficacy of clear aligners in controlling orthodontic tooth movement: a systematic review. Angle Orthod. 2015;85(5):881-889. 17. Gu J, Tang JS, Skulski B, et al. Evaluation of Invisalign treatment effectiveness and efficiency compared with conventional fixed appliances using the Peer Assessment Rating index. Am J. Orthod. Dentofacial Orthop. 2017;151(2):259-266. Antonino G. Secchi, DMD, MS, is an alumnus of the University of Pennsylvania School of Dental Medicine, where he received his Doctorate of Dental Medicine, Certificate in orthodontics, and a Master of Science in oral biology. Dr. Secchi is a Diplomate of the American Board of Orthodontics and member of the prestigious Edward H. Angle Society of Orthodontists. He also holds membership in various local, national, and international dental and orthodontic societies and was the 2016 President of the Greater Philadelphia Society of Orthodontists. Dr. Secchi is the founder of the Complete Clinical Orthodontics System™ (CCO System), which he teaches to orthodontists in the United States and worldwide. He is currently in practice in Pennsylvania. Disclosure: Dr. Secchi is a lecturer for the Dentsply Sirona Complete Clinical Orthodontics courses. Today SureSmile Ortho 7.5 allows the integration of intraoral scan data and CBCT data, which makes the software incredibly powerful for treatment planning of more complex cases. anterior region, which is being discussed more frequently. In a Class II situation where clinicians want to maintain or improve the mandibular incisor angulation, they must depend upon growth as well as a distalization effect of the maxillary arch. skeletal profile (ANB 4°) with mild maxillary prognathia (SNA 86°). Dentally, he presented with a Class I Division 1 incisor relationship. Midlines are coincident, and the mandibular left first molar was in buccal crossbite. He has 5 mm of overjet and 5 mm of overbite. The patient had mild crowding in the maxillary anterior and no crowding in the mandibular anterior. The curve of Spee is 2 mm, and the mandibular incisors were proclined (IMPA 106). He had a concave facial profile and an obtuse nasolabial angle. A TMJ exam revealed no joint sounds, and joints were asymptomatic. The patient had balanced maxillary and mandibular facial heights, and his lips were competent. He showed 100% of incisors upon smiling with 1 mm of gingival display and a concave facial profile with an obtuse nasal labial angle of 103°. Jack Fisher, DMD, completed his orthodontic training at the Medical College of Georgia in 1982. Since then he has been in the fulltime practice of orthodontics in Kentucky and Tennessee. He has lectured both in the United States and internationally. Dr. Fisher is a member of the Southern Association of Orthodontics and the American Association of Orthodontics. He is presently a faculty member in the orthodontic department at The University of Tennessee. Dr. Fisher has taught a 2-day cadaver course for the insertion and use of temporary skeletal anchorage devices for 8 years. He has written several articles on the use of these devices. He recently has developed and taught a course on the use of CBCTs for the diagnosis and treatment of orthodontic patients. Disclosure: Dr. Fisher is a key opinion leader for Planmeca. a fresh approach to clear aligners smart moves® integrates realistic aligner treatment plans with sophisticated 3D software, and is compatible with any intraoral scanner. Our predictability index provides a baseline for case outcomes so your treatment projections are always realistic. smart moves treatment proposals show everything you need to make informed decisions about your patients’ treatment plans. Track their progress, make refinements, and share visuals with them at any time within our software portal. When you prefer more hands-on support, our experienced Great Lakes technicians are always ready to individually work with you, right here in the United States. Learn more and get in touch with a smart moves expert. dibular incisors with maxillary incisors in a relatively normal position (Figure 3). The panoramic radiograph was reconstructed from a CBCT. Panoramic analysis revealed no pathology, and third molars were developing normally. Model analysis revealed a Class II molar relationship on the left and right with moderate overbite and overjet. The maxillary midline is coincident with facial midline, and the mandibular midline is coincident with the maxillary midline. The curve of Spee is moderate. Transversely, the mandibular left first molars and buccal crossbite. Treatment alternatives Three treatment options were presented to the patient: 1. Traditional headgear to restrain maxillary growth and to allow for mandibular growth to occur. 2. Extract maxillary first premolars and close space. 3. Place temporary skeletal anchorage devices to distalize/restrain the maxillary arch while allowing for mandibular growth. G&H® premium archwires are second to none in the industry. May 4-7, in Los Angeles, CA. An archwire is far from a commodity in your practice. G&H knows the integral role the archwire plays in achieving your successful clinical outcomes. Every wire alloy demands specific processing techniques to fully express its consistent tooth-moving properties. G&H has been second to none in the industry, manufacturing premium archwires in the U.S.A. for more than 40 years. Order products now thru April 19th and SAVE 5% plus FREE SHIPPING to your office* or to our booth for pick up during the AAO! *Orders to offices will begin shipping April 29, 2019. Visit GHOrthodontics.com to learn more and to place your order today! Precision engineered and manufactured in the U.S.A. Your patients deserve to keep their smile! Prevent relapse and maintain a beautiful smile with Prezurvâ&#x201E;˘ invisible retainers. Due to extended wear, retainers fatigue and begin to lose their shape. The Prezurv system provides multiple sets of retainers to assure teeth stay in their optimal position. Patients worry less about lost, broken or discolored retainers. Efficient and cost effective system to help maintain long term smile protection. Slot precision is critical to efficiently delivering the desired prescription. Using stateof-the-art 3D printing technology, LightForce is able to manufacture brackets with slot dimensions that are precise and accurate time after time. Anatomical fit as a result of next-generation, highly accurate 3DP Better-fitting braces have long been recognized as improving bonding characteristics and treatment efficiency. Until LightForce, compound contouring was the industry’s attempt to better match bracket bases to tooth morphology. Now using stateof-the-art 3D printing technology and digital treatment planning capabilities, LightForce is able to create bases that are fully customized, mirroring each individual tooth and resulting in an even more anatomical fit. Consistent cement layer for more predictable bond strength With standard brackets, the cement layer thickness varies to compensate for mismatches between the bracket base and the patient’s tooth anatomy. Thick or uneven cement distribution at the brackettooth interface can negatively impact bond integrity as well as proper expression of the bracket prescription. Low profile for patient comfort with highly contoured edges and smooth tie-wings Patient comfort with brackets — while tooth-movement technology has helped clinicians to reach orthodontic goals, patients will also measure their orthodontic experience by the amount of comfort or discomfort that they experience throughout the process. This is integral to non-relative patient referrals, multi-sibling referrals, and the wordof-mouth reputation of the office. In their marketing strategies, orthodontists who are vying to attract patients in this competitive marketplace can shine a bright spotlight on the comfort aspect of patient treatment when using these unique brackets. LightForce Brackets are designed with patient comfort in mind. Our polycrystalline material and custom base provide the necessary strength in a low-profile bracket designed to minimize contact with soft tissues. Additional comfort features include smooth contoured edges and tie wings. Software Simple interface Orthodontists want to maximize time spent with patients, not time in front of a computer screen. LightForce’s simple and intuitive online interface is designed for fast and efficient treatment planning. REFERENCES 1. Weber DJ 2nd, Koroluk LD, Phillips C, Nguyen T, Proffit WR. Clinical effectiveness and efficiency of customized vs. conventional preadjusted bracket systems. J. Clin Orthod. 2013;47(4):261-266. 2. Cash AC, Good SA, Curtis RV, McDonald F. An evaluation of slot size in orthodontic brackets--are standards as expected? Angle Orthod. 2004;74(4):450-453. 3. Jain M, Shetty S, Mogra S, Shetty VS, Dhakar N. Determination of optimum adhesive thickness using varying degrees of force application with light-cured adhesive and its effect on the shear bond strength of orthodontic brackets: an in vitro study. Orthodontics (Chic.). 2013;14(1):e40-e49. Stuart L. Frost, DDS, received his dental degree at the University of the Pacific School of Dentistry. Following a 1-year fellowship in temporomandibular joint dysfunction (TMJ), he completed a 2-year residency in orthodontics and dentofacial orthopedics at the University of Rochester. Dr. Frost practices in Mesa, Arizona. He is currently a part-time associate clinical professor at the University of the Pacific orthodontic program and has lectured on the Damon™ System at several Damon Forums and other Ormco-sponsored events, including the national American Association of Orthodontists Annual Session, component meetings, and his own Damon in-office seminars. FOCUS ON: GUMMY SMILE dismissed it as a possibility without going through a painful surgery. I love seeing their eyes light up as they consider the possibility of having their life transformed through a noninvasive orthodontic treatment that usually takes less than 24 months. This case study will discuss a patient I treated with my gummy smile protocol and demonstrate just how spectacular these treatments can be with the right simple protocols. root length and height. She has never had orthodontic treatment before, so I thought this would be an amazing experience for her. Super Clear, Super Strong, Super Affordable! Used by some of the largest practices in the country! Quality you can trust... cure after cure! Figure 5 shows Brooke at 10 months of intrusion. This is about the time when I take a look at the photos to see what’s left of the gummy smile. Keep in mind when evaluating at this point that any patient who is treated like this for a gummy smile will need gingival contouring at the end of treatment. Everyone loses his/her gingival architecture to some degree after impacting the maxilla. At this point, Brooke’s gummy smile is no longer looking gummy! I decided to take the TADs out and work on the finishing touches for her case. TAKE ADVANTAGE OF THESE OFFERS LOW SPEED ORTHO-DEBONDING KIT The Meditorque Elite™ Debonding Kit delivers up to 25K RPMs , allowing you to use your favorite highspeed, friction-grip burs for ortho-debonding. Allows debonding debris to slowly rise from the tooth directly into suction. Traditional handpiece blowing air to the debonding area causing increased sensitivity. The Air-Free does not blow air to the debonding area resulting in added comfort for your patient. ($399.00 ea) Mari’s List Customer? Stop by our booth for your pricing. * A Clinic Pack Consists of 100 identical burs. Jay B. Burton, DMD, completed his undergraduate education at Bethel University and earned an MBA from The University of Tennessee at Martin, before achieving his Doctor of Dental Medicine degree at the University of Louisville. While in dental school, Dr. Burton served as class president and conducted dental mission work in Belize and the Philippines. Dr. Burton subsequently completed his Orthodontic Residency at the prestigious New York University (NYU) in Manhattan before achieving certification from the American Board of Orthodontics. Aside from his passion for making healthy smiles, Dr. Burton enjoys spending time with his wife, Sarah, and their children, Nora, Baker, and Charlotte. Dr. Burton can be reached through www.smilemaker.com. Disclosure: Dr. Burton is receiving an honorarium from Planmeca for this article. bone located on the buccal of the teeth to which the appliance would be attached. The question of these dentoalveolar boundaries is significant as we can now consider the limitations to treatment specifically in the AP and transverse dimensions. One example is the patient who may need extractions due to bimaxillary protrusion. Orthodontists can consider the amount of bone available in the direction the teeth are to be moved and even simulate the tooth movement revealing exactly how much bone would be present if that treatment plan were carried through. Orthodontists must also now consider the possibility and/ or reality that, in many cases, there may be a lack of bone in the direction we would like to move the teeth, resulting in the question of whether or not the patient should be treated. When considering these boundaries, we also must consider morphology for cases that will involve dental implants, bone grafts, or temporary skeletal anchorage devices. Attention will be given to when and how this technology can be used and recommended. A fully integrated intraoral scan, taken with an intraoral scanner (Emerald™ by Planmeca in my office), allows for a streamlined approach to diagnosis and treatment planning as well as the ability to virtually simulate treatment with respect to the patient’s individual anatomy. Rendered/reconstructed images The number of different types of reconstructed images possible is limited only by the clinicians’ need and imagination. Orthodontists can view any part of the volume in three planes of space to localize and better visualize that which they are interested in seeing. Specific rendered images useful for orthodontic diagnosis and treatment planning purposes will be discussed as well. CONTINUING EDUCATION planes. Most orthodontists are familiar with the collapsed version of these images as the PA cephalometric radiograph, the submentovertex radiograph, and the lateral cephalometric radiograph. Essentially, CBCT allows the clinician to expand out the 2D images and look at specific areas of interest as a result of being able to scroll through the various planes and slices. orthodontist can use a photo taken in natural head position to manipulate the orientation of the rendered image. develop a systematic approach for both the review of the CBCT for incidental findings/ pathology as well as for treatment planning decisions. Each article is equivalent to two CE credits. Available only to paid subscribers. Free subscriptions do not qualify for the CE credits. Subscribe and receive up to 24 CE credits for only $149; call 866-579-9496 or visit www.orthopracticeus.com to subscribe today. To receive credit, complete the 10-question test by circling the correct answer, then either: n	Post the completed questionnaire to: Orthodontic Practice US CE 15720 N. Greenway-Hayden Loop. #9 Scottsdale, AZ 85260 n	Fax to (480) 629-4002. To provide feedback on this article and CE, please email us at education@medmarkmedia.com Legal disclaimer: The CE provider uses reasonable care in selecting and providing accurate content. The CE provider, however, does not independently verify the content or materials. Any opinions expressed in the materials are those of the author and not the CE provider. The instructional materials are intended to supplement, but are not a substitute for, the knowledge, skills, expertise and judgement of a trained healthcare professional. Please allow 28 days for the issue of the certificates to be posted. Your CE certificate(s) will be emailed to the address you provided above. 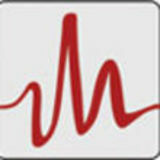 Please add medmarkmedia.com to your Approved Senders List in your email account. You may need to check your junk/spam folder for your certificate email. Doseâ&#x201E;˘ scan captured by the Planmeca unit). a. 10% b. 25% c.	50% d.	77% 5. Looking forward, CBCT might help us with risk assessment by assessing ________. a.	bone density b.	visualizing root proximity and resorption c.	providing the imaging data to support treatment simulation and technology-aided treatment d. all of the above 6. Many orthodontists who use 3D-imaging technology begin their diagnostic/treatment planning process by first _______ prior to even thinking about orthodontic diagnosis and treatment decisions (as these can be distractions as the clinician is looking for incidental findings and pathology). a.	examining the information from all of the slices in each plane b. taking digital 2D images anyway c.	only looking at the 3D reconstruction d.	only looking at the sagittal view 7. With regard to when and how, the author likes to review the CBCT _______. Identify some testing methods for these chronic pain and breathing disorder issues. and where the TMJ disc is recaptured or displaced.5,6,7,8 My search for novel ways of using technology to treat chronic pain and breathing disorders continues. Steven R. Olmos, DDS, DABCP, DABCDSM, DAAPM, DABDSM, FAAOP, FAACP, FICCMO, FADI, FIAO, has been in private practice for more than 30 years, with the last 20 years devoted to research and treatment of craniofacial pain, temporomandibular disorder (TMD), and sleep-related breathing disorders. He obtained his DDS from the University of Southern California School of Dentistry and is board certified in both chronic pain and sleep-breathing disorders by the American Board of Craniofacial pain, the American Academy of Integrative Pain Management, the American Board of Dental Sleep Medicine, and the American Board of Craniofacial Dental Sleep Medicine. Dr. Olmos is the founder of TMJ & Sleep Therapy Centres International, with 50 licensed locations in seven countries dedicated exclusively to the diagnosis and treatment of craniofacial pain and sleep disorders. Disclosure: Aqualizer, Mute, and Max-Air are sponsors for Dr. Olmos’ courses. Figure 23: Starling resistor model. of chronic face pain and sleep-breathing disorders and the technology that exists, I would now be able to help that woman who was suffering way back in my dental school education. OP REFERENCES 1. Smith MR, Wickwire EM, Grace EG, et al. Sleep disorders and their association with laboratory pain sensitivity in temporomandibular joint disorder. Sleep. 2009;32:779-790. 2. Sanders AE, Essick GK, Fillingim R, et al. Sleep apnea symptoms and risk of temporomandibular disorder: OPPERA cohort. J Dent Res. 2013;92(suppl 7):70S-77S. Wickwire E, Bellinger K, Kronfli T, et al. Relations between objective sleep data, sleep disorders, and signs and symptoms of temporomandibular joint disorder (TMD). J Pain. 2008;9(4)(suppl 2):14. 4. Olmos S. Comorbidities of chronic facial pain and obstructive sleep apnea. Curr Opin Pulm Med. 2016;22(6):570-575 5. Ishigaki S, Bessette RW, Maruyama T. Vibration of the temporomandibular joints with normal radiographic imagings: comparison between asymptomatic volunteers and symptomatic patients. Cranio. 1993;11(2):276-283. Sharma S, McCall WD, Crow H, Gonzalez-Stucker Y. Reliability and Diagnostic Validity of Joint Vibration Analysis. Presentation at 2015 IADR Meeting, Boston, MA, Based on Master’s Thesis of S. Sharma. School of Dental Medicine, State University of New York(SUNY) Buffalo: Buffalo, NY. 7. Radke JC, Kull RS. Comparison of TMJ vibration frequencies under different joint conditions. Cranio. 2015;33(3):174-182. 8. Sharma S, Crow HC, Kartha K, McCall WD Jr, Gonzalez YM. Reliability and diagnostic validity of a joint vibration analysis device. BMC Oral Health. 2017;17(1):56. 9. Edwards R, Altaligbi M, Flores-Mir C. The frequency and nature of incidental findings in cone-beam computed tomographic scans of the head and neck region: a systematic review. J AM Dent Assoc. 2013;144(2):161-170. 10. Olmos S. Airway Centered Dentistry: (The A, B, C’s of Treatment for Chronic Face Pain/OSA and Closing Anterior Openbite Without Ortho). J Oral Health. 2017;44-56. 11. Ebrahim S, Montoya L, Busse JW, et al. The effectiveness of splint therapy in patients with temporomandibular disorders: a systematic review and meta-analysis. J AM Dent Assoc. 2012;143(8):847-857. Figure 37: Titration HST titration study with hybrid therapy (normal respiration) Dentistry research network. J Am Dent Assoc. 2015;146(10):721 -728. 14. Centers for Disease Control and Prevention. National Center for Health Statistics. National Health and Nutrition Examination Survey Data. 2002. http://www.cdc.gov/nchs/nhanes.htm. Accessed February 20, 2019. 15. Iijima K, Shimoyama N, Shimoyama M, et al. Effect of repeated irradiation of low-power He-Ne laser in pain relief from postherpetic neuralgia. Clin J Pain. 1989;5(3):271-274. 16. Walker J, Akhanjee L, Cooney M, et al. Laser therapy for pain of trigeminal neuralgia. Clin J Pain. 1988;3:183-187. 17. Iijima K, Shimoyama N, Shimoyama M, Mizuguchi T. Evaluation of analgesic effect of low-power He:Ne laser on postherpetic neuralgia using VAS and modified McGill pain questionnaire. J Clin Laser Med Surg. 1991;9(2):121-126. 18. Walker J. Relief from chronic pain by low power laser irradiation. Neurosci Lett. 1983;43(2):339-344. 19. Eckerdal A, Bastian H. Can low reactive-level laser therapy be used in the treatment of neurogenic facial pain? A double- blind, placebo controlled investigation of patients with trigeminal neuralgia. Laser Therapy. 1996;8:247-252. 20. Moore KC, Hira N, Kramer PS, Jaykumar CS, Ohshiro T. A double blind crossover trial of low level laser therapy. Laser Therapy. 1989;1(1):7-9. 21. Samosiuk IZ, Kozhanova AK, Samosiuk NI. [Physiopuncture therapy of trigeminal neuralgia]. Vopr Kurortol Fizioter Lech Fiz Kult. 2000;6:29-32. 22. Vernon LF, Hasbun RJ. Low-level laser for trigeminal neuralgia. Practical Pain Management. 2014;8(6):56-63. 23. Kim HK, Jung JH, Kim CH, Kwon JY, Baik SW. The effect of lower level laser therapy on trigeminal neuralgia. Journal of the Korean Pain Society. 2003;16:37-41. 24. Katusic S, Beard CM, Bergstralh E, Kurland LT. Incidence and clinical features of trigeminal neuralgia, Rochester, Minnesota, 1945-1984. Ann Neurol. 1991;27(1):89-95. Orthop. 2018;154(4):535-544. 31. Singh D, Olmos S. Use of a sibilant phoneme registration protocol to prevent upper airway collapse in patients with TMD. Sleep Breath. 2007;11(4):209-216. 32. Olmos SR, Rago M. Oral appliances — past, present, and future. Orthodontic Practice US. 2018;9(4):32-37. 33. Gelardi M, Del Giudice AM, Cariti F, et al. Acoustic pharyngometry: clinical and instrumental correlations in sleep disorders. Braz J Otorhinolarngol. 2007;73(2):257-265. 34. Deyoung PN, Bakker JP, Sands SA, et al. Acoustic pharyngometry measurement of minimal cross-sectional airway area is a significant independent predictor of moderate-to-severe obstructive sleep apnea. J Clin Sleep Med. 2013;9(11):1161-1164. 35. Zeng B, Ng AT, Qian J, et al. Influence of nasal resistance on oral appliance treatment outcome in obstructive sleep apnea. Sleep. 2008;31(4):543-547. 36. Michels Dde S, Rodrigues Ada M, Nakanishi M, Sampaio AL, Venosa AR. Nasal involvement in obstructive sleep apnea syndrome. Int J Otolaryngol. 2014;2014. 37. Corey JP. Acoustic rhinometry: should we be using it? Curr Opin Otolaryngol Head Neck Surg. 2006;14(1):29-34. 38. Roithmann R, Cole P, Chapnik J, et al. Acoustic rhinometry, rhinomanometry, and the sensation of nasal patency: a correlative study. J Otolaryngol. 1994;23(6):454-458 39. Pliska BT, Almeida FR. Tooth movement associated with CPAP therapy. J Clin Sleep Med. 2018;14(4):701-702. 40. Venema J U, Stellingsma C, Doff M, Hoekema A. Dental Side Effects of Long-Term Obstructive Sleep Apnea Therapy: A Comparison of Three Therapeutic Modalities. Journal of Dental Sleep Medicine. 2018;5(2):39-46. 25. National Institute of Neurological Disorders and Stroke, National Institutes of Health, Bethesda, MD. 41. Ueda H, Almeida FR, Lowe AA, Ruse ND. Changes in occlusal contact area during oral appliance therapy assessed on study models. Angle Orthod. 2008;78(5):866-872. 26. Almos, S. Chasing Pain: Diagnosing and Treating Trigeminal Neuralgia in General Dentistry. Dentaltown Magazine. 2016; 35-40. 42. Pliska BT, Nam H, Chen HN, Lowe AA, Almeida FR. Obstructive sleep apnea and mandibular advancement splints. J Clin Sleep Med. 2015;11(4):503-504. 27. Doshi-Mehta G, Bhad-Patil WA. Efficacy of low-intensity laser therapy in reducing treatment time and orthodontic pain: a clinical investigation. Am J Orthod Dentofacial Orthop. 2012;141(3):289-297. 43. Sakaguchi K, Mehta NR, Abdallah EF, et al. Examination of the relationship between mandibular position and body posture. Cranio. 2007;25(4):237-249. 28. Cruz DR, Kohara EK, Ribeiro MS, Wetter Nu. Effects of low-intensity laser therapy on the orthodontic movement velocity of human teeth: a preliminary study. Lasers Surg Med. 2014;35(2):117-120. 12. John CR, Gandhi S, Sakharia AR, James TT. Maxillomandibular advancement is a successful treatment for obstructive sleep apnoea: a systematic review and meta-analysis. Int J Oral Maxillofac Surg. 2018;47(12):1561-1571. 29. Qamruddin I, Alam MK, Mahroof V, et al. Effects of low-level laser irradiation on the rate of orthodontic tooth movement and associated pain with self-ligation brackets. Am J Orthod Dentofacial Orthop. 2017;152(5):622-630. 44. Maeda N, Sakaguchi K, Mehta NR, et al. Effects of experimental leg length discrepancies on body posture and dental occlusion. Cranio. 2011;29(3):194-203. 45. Driver HS, Pereira EJ, Bjerring K, et al. Validation of the MediByte® type 3 portable monitor compared with polysomnography for screening of obstructive sleep apnea. Can Respir J. 2011;18(3):137-143. 46. Pereira EJ, Driver HS, Stewart SC, Fitzpatrick MF. Comparing a combination of validated questionnaires and level III portable monitor with polysomnography to diagnose and exclude sleep apnea. J Clin Sleep Med. 2013;9(12):1259-1266.
veryone knows what orthodontists do: braces. From a patient’s perspective, orthodontists simply straighten teeth, and that’s it. But if they only knew what orthodontists could do for them thanks to advancements in digital technology such as cone beam computed tomography. While admittedly clear aligners are making the image of brackets slowly fade in patients’ minds, straightening teeth in general is just the tip of the iceberg of what CBCT allows orthodontists to do for their patients. and enlarged tongues. We’ve known since the 1960s that expanding the maxilla can increase nasal air volume significantly. Airway has gained national attention in orthodontics over the past 5 years as a movement of “airway-friendly” orthodontics has emerged. Dr. Robert “Tito” Norris completed dental school at the University of Texas Health Science Center, San Antonio, and did a general practice residency at the Washington DC VA Medical Center, followed by an orthodontic residency at Howard University. He then served 3 years in the Air Force as an orthodontist in Misawa, Japan, before opening his practice in 1998 in San Antonio. Dr. Norris was board certified in 2003 and has served as a clinical consultant for numerous technology companies along the way. Disclosure: Dr. Norris is a key opinion leader for Carestream Dental. continue to take the lead in this area because constricted airways are simply not on the radar for most physicians, and patients are suffering because of it. TMJ discomfort Most orthodontists have some basic understanding of TMJ but many are simply too busy straightening teeth to deal with it. Imaging of the joint with a CBCT system plays an important role in properly managing these patients. With a large FOV CBCT system like the CS 9300, orthodontists are able to offer an interdisciplinary solution for patients in TMJ discomfort. REFERENCES 1. Kumar SA, Gurunathan D, Muruganandam E, Sharma S. Rapid Maxillary Expansion: A Unique Treatment Modality in Dentistry. Journal of Clinical and Diagnostic Research. 2011;5(4) 906-911. Just some of the amazing features of the SLX 3D Bracket EZ Twist open/close. A feather touch and slight twist of the instrument propels the slide to the open and locked position. Full M/D slot coverage. For unmatched rotational control. Helps ensure you finish faster! Superior esthetics. Smoothest contours ever. Looks and comfort for what patients want. Proven slot geometries. Tight tolerances. Exacting torque values, in/out thicknesses, and slot depths mean less wire bending for faster, more high-quality finishes. wires for metal brackets — designed to standardize and simplify archwire progression. The M-Series Wires have been engineered in tandem with the SLX 3D Brackets to fit the shape of the bracket slot accurately and precisely. The goal is to consistently achieve total treatment times of 12 months or less. This information was provided by Henry Schein® Orthodontics™. Not Just Another Clear Aligner The SLX ™ Clear Aligner system by Henry Schein® Orthodontics™ incorporates the paradigm-changing SAGITTAL FIRST ™ Philosophy with Carriere® MOTION 3D CLEAR ™ for ultimate aesthetic and efficiency. © 2019 Ortho Organizers, Inc. 1822 Aston Ave., Carlsbad, CA 92008-7306, USA. All rights reserved. M1494 01/19 U.S. Patent No. 7,621,743; 7,238,022; 7,618,257; 6,976,839 and foreign patents. care into the business of orthodontic delivery. Our patients’ chief complaints are emotional and difficult to “upload” direct from consumer. Our advanced training on the biology and mechanics of tooth movement offer improved diagnosis and treatment plans compared to nonspecialists. Adjunctive technologies in our experienced hands will always deliver more when coupled with individualized treatment and superior biomechanics. This offers us the opportunity to stand out as providing “different and better” care than dated, or “cookie-cutter,” alternatives. Terry A. Sellke, DDS, is a native Illinoisan. His fervor for Illinois extends to his academic background, having enrolled in the University of Illinois undergraduate and dental school. He graduated with his Doctorate of Dental Surgery in 1971. Two years later, he achieved a specialty degree in orthodontics. In 1974, he received a Master’s degree in orthodontics, the same year that he opened the first office of what was to become Drs. Sellke and Reily, Ltd. In 1980, Dr. Sellke became a Diplomate of the American Board of Orthodontics. He still teaches orthodontics at the University of Illinois College of Dentistry, where he earned the titles of professor, master clinician, co-clinic director, and master’s thesis advisor. Dr. Sellke lectures domestically and internationally on clinical orthodontics as well as another of his passions, applying business principles to the practice of orthodontics. Disclosure: Dr. Sellke discussed his experience using various accelerated tooth movement technologies on a CE webinar hosted by Propel Orthodontics in January 2019. He has lectured previously on behalf of Dental Monitoring and SureSmile. Air/Water Disposable Syringe Tips Also available in White! â&#x20AC;¢ Ideal for heavy stain removal â&#x20AC;¢ Great for ortho cleanings â&#x20AC;¢ Provides access under ortho wires and around brackets. ORTHODONTIC PERSPECTIVE internationally on breakthrough technologies that accomplish the goals outlined previously. In my busy practice, these breakthroughs have allowed us to differentiate even as we provided improved care with less inconvenience to our patients. Here is what we have done. The 5th Annual MKS Forum is the LARGEST Orthodontic Business Event in the U.S. October 24-26, 2019 Hilton Anatole Dallas www.MKSForum.com The 5th annual MKS Forum will once again focus on the business of orthodontics. Thousands of attendees return to MKS each year to learn new ways to increase their practice growth and profits. New technologies, new competitive marketing tools, new financial tools and better ways to provide enhanced patient care. Orthodontics is under siege from several angles and doctors learn how to thrive and win from their most successful peers. Don’t miss the MKS Forum 5th anniversary party, Thursday, October 24, 2019! Also join us for an exclusive Invisalign event prior to the MKS Forum, Thursday, October 24, 2019. AAO Some of the surprising learning experiences over the last four years of MKS: Special: Save $150 for Doctors • Why growth into multi-specialty destroyed a great orthodontic practice. & $100 for Teams. • How the largest practice in a state competes with Smile Direct Club and wins. Discount Code: • The doctor who generates $6,000,000 in annual production due to the brackets he chose. MKSMAY2019 • How one practice gets 1000+ new patient referrals from nearby pedodontist practices every year. • How a doctor with a practice, appraised at a value of 80% of collections, sold it for 3.5X collections. • Why dealing with your escheatment issues now rather than later could save you $1,000,000 or more. To exhibit to this exclusive group of orthodontists, contact Susie Snow at 305-998-9893, or visit www.MKSSponsor.com. uilt to Last. Built for You. Built by Boyd” is more than a tagline; it signifies the commitment that everyone at Boyd makes to each and every one of our customers. Best known for the durability and reliability of our award-winning products — including treatment chairs, mobile storage, and clinical cabinetry — we combine over 60 years of design and manufacturing expertise to perfectly fit your unique space and personal style. We take great pride in the craftsmanship and longevity of all products built at our U.S.-based facility, so you can take pride in your office for years to come. The M3000LC Exam and Treatment Chair is Boyd’s most popular option among orthodontists, combining affordability, function, and a wide variety of practical features including all-steel frame construction, ergonomically designed winged back, lowvoltage DC motor actuators, integrated full function foot control, snap-on upholstery, and choice of seven headrest styles. What makes the MC3000LC perfect for your everyday use? Its motorized column base with 8" vertical lift allows the chair’s height to be adjusted for maximum ergonomic positioning, ensuring your comfort as well as your patients’ comfort. Perfect for orthodontic consultation rooms, the award-winning M3010 Series Exam and Treatment Chairs’ synchronized drop-toe design provides your patients with the most natural seated position during consultations or minor exams. Like the M300LC, these chairs come standard with all-steel frame construction, ergonomic winged backs, integrated full-function foot control, and more. Enhance these chairs with Ultraleather Pro™ upholstery and Memory Foam cushioning for maximum comfort. To complement your exam and treatment chairs, Boyd offers 10 standard Delivery Unit models for chairside, rear, or concealed delivery. With a nearly limitless selection of laminate colors and grains, these units combine functionality, efficiency, and style. Choose standard or square back models, depending on your unique storage and space requirements. We recommend starting your search with the CSU-356 Delivery Unit, which offers ample storage in a unit less than 25" wide. The BOS-279, Boyd’s most popular Doctor/Assistant Seat, offers an ergonomic saddle seat, adjustable seat height and tilt, and a floating lumbar-support back. You’ll find a perfect fit with the seat’s wide range of possible adjustments. Like our patient chairs, Boyd’s doctor/assistant seats are designed with your long-term comfort and spinal health in mind. Once you’ve chosen your seating and storage solutions, complete the picture with Boyd’s LED Exam Lights, which provide the latest in operatory light technology. Their cool, power-efficient, and reliable LEDs emit clear and natural white light for maximum visibility. Choose the C300 LED Exam Light for its clear and natural regeneration light technology, with an IR sensor with intensity up to 30,000 LUX and 95Ra rendering, three-axis head movement, and adjustable, sterilizer-safe hand grips. Choose the C500 Camera Exam Light for its built-in HD video camera, hands-free operation, selection of three different color temperatures, and more. The Boyd team has made every effort to create specialized products that are truly “Built for You.” These featured orthodontic products can be combined with Boyd’s custom clinical and office cabinetry — with nearly limitless combinations of color and print laminates — to create a fully cohesive office space. When you work with the Boyd team, we recognize your unique needs and offer the widest range of personalization options in the industry, so feel free to consult your sales representative about your specific needs. Call today, or request a quote online to get started! To learn more, visit us at www.boyd industries.com. You can also follow us on Instagram and Twitter @BoydIndustries. Boyd Industries is an ISO 13485:2016 certified company. OP This information was provided by Boyd Industries. ore and more patients are asking for aligners, but due to costly aligner lab fees, many are forced to decline treatment or go online for do-it-yourself aligners. Thanks to SunClear 3D aligner design software and manufacturing solution, digital orthodontics has now become more affordable. SunClear aligners are the clear alternative to expensive and overpriced aligner systems. •	Save up to 50% on aligner lab fees. •	High-quality aligners design-ready for approval in a matter of days after the impression has been received by the lab. Sun Dental Labs now offers a doctorsupervised state-of-the-art comprehensive treatment that is safe and effective. Once the necessary records are uploaded, a custom and personalized aligner plan is generated by our team. Then you can use the SunClear 3D orthodontic software to review, modify, and accept the plan. We can accept digital STL files from any intraoral or desktop scanner for aligner treatment. The device is customized for each patient and follows a prescription as submitted by the dentist. What does the SunClear Aligner fee include? The fee includes a full-customized aligner plan, including any number of revisions until approved. There are no setup fees ($95 value), and a free set of retainers ($99 value) is included. There is also one free refinement included during treatment. The base fee includes up to 20 aligners/trays, and only $15 per aligner above 20 aligners. We will charge your credit card when the case is completed and shipped out. you receive your login information, using the Google Chrome browser again, you can log into your SunClear Account. This is where you will be able to enter patients and create cases for them by uploading their records, including a panoramic X-ray, digital models (if applicable), and the patient photos. Once the patient information is entered with the treatment objectives, we will create a treatment plan for you to approve using the information that was provided to us. Once the treatment plan is created, you will be able to share the simulated tooth movement with the patients enabling them to see how their teeth will look once treatment is completed. The straight talk Poorly aligned teeth can put extra stress and pressure on your teeth and jawbone, which can cause: •	Receding gums and gum disease •	Chipping and wearing of teeth •	Food traps, bad breath, and difficulty flossing •	Jaw pain and headaches •	Sleep apnea It’s easier to brush and floss around properly aligned teeth, and you are less likely to have pockets between gums and teeth that trap bacteria and food that may cause plaque, decay, and bad breath. Properly aligned teeth reduce plaque, tooth decay, and the risk of gum disease. Now thanks to SunClear aligners, patients who were previously unable to complete an aligner plan due to cost or complexity can enjoy the health benefits of aligned teeth. OP This information was provided by Sun Dental. digital workflow. Planmeca Creo C5 is custom-engineered for dental professionals and specified for use in high-speed printing of surgical guides and dental models. Planmeca Creo C5 uses LCD Photomask Technology to create a uniform layer of light that virtually eliminates imperfections when printing. LCD technology is more accurate and has a faster build speed than other Digital Light Projection (DLP) systems making Planmeca Creo C5 one of the fastest 3D printers currently on the market. Planmeca Creo C5 delivers extraordinary precision and impeccable resolution under 50 microns. The capabilities of this revolutionary high-speed printer include a surgical guide or a dental model in less than 15 minutes, and printing up to five full arches in one print. Ease of use As with all Planmeca products, Planmeca Creo C5 is open so you can work with STL and PLY files for a seamless experience when completing your digital workflow. An easyto-use touch display with pre-programmed settings and medically approved resin cartridges makes Planmeca Creo C5 simple to operate. Materials for Planmeca Creo C5 come in convenient resin cartridges that eliminate waste. The capsules ensure that the valuable resin inside is always utilized efficiently. This compact, self-cleaning 3D printer does not require calibration — just plug and print. Applications Planmeca Creo C5 offers high-speed printing to support your specialty procedures regardless of whether you are printing dental models for a treatment plan or performing implant surgery. Planmeca Creo C5 guides you through every step to reach the optimal resolution so you can provide better care for your patients. print quality for higher resolution and precision •	Resin cartridge — cartridge dosing of medically approved resins eliminates excess waste of costly resins •	No calibration needed — plug-n-play •	Touch display — easy-to-use display with pre-programmed material settings •	Open STL and PLY files — most commonly used file formats by CAD programs for seamless integration •	Compact design — small footprint for desktop use •	Self-cleaning For more information about the Planmeca Creo C5 High-Speed 3D Printer, visit http://www2.planmecausa.com/3ddental-printing-creo-c5. OP This information was provided by Planmeca. have a big impact. At Planmeca, we’ve built our solutions on the smallest details. The small things form the big picture – delivering treatment and care your patients deserve. Learn more about Planmeca products today. OrthoFoam step-by-step instructions Brushing Dispense 1/2 to 1 full pump of foam inside the mouth or on your toothbrush. Brush teeth for up to 60 seconds. Spit out foam, and rinse mouth with water. Can be used as a stand-alone cleaner/whitener or in combination with any fluoridated toothpaste. Add OrthoFoam to your toothbrush (with toothpaste), or pump directly into your mouth as you brush. Rinsing Dispense 1/2 to 1 full pump of foam inside mouth and swish for up to 60 seconds. Then spit out foam, and rinse mouth with water. In trays (custom or disposable) Dispense 1 or 2 full pumps of foam into trays, and apply to teeth for 3 minutes. Stand over sink during treatment, spitting out excess foam. Do not swallow. After 3 minutes, rinse with water. Repeat once or twice daily. Trays are available at eversmilewhite.com/trays. Get in touch To learn more about EverSmile® products, get free patient coupons (available at CVS), or to place an order, visit doctors. eversmilewhite.com with the passcode “orthofoam” to enter our Doctor’s Portal. Or you can send us an email at info@ever smilewhite.com, or give us a call Monday through Friday 8 a.m. to 6 p.m. Pacific time at 855-595-2999. OP This information was provided by EverSmile®. improved gingival health, and tooth whitening over and under the composite resin used to affix the brackets, as compared to a control product using 1.5% hydrogen peroxide with the same surfactants and cleaners. In a retrospective study that Dr. Florman performed on aligner patients with composite resin attachments (buttons), using the formula in EverSmile’s WhiteFoam, it was noted that teeth whitening occurred even under the attachments. OrthoFoam was soon launched in the dental market in 2017. OrthoFoam allows patients to brush with the product alone, or in conjunction with their favorite toothpaste. OrthoFoam can also be used as a therapeutic mouth rinse alone and can be placed into custom or foam trays for patients to apply at home on a daily basis. Doctors who use OrthoFoam report that after 4-6 weeks of use, a noticeable plaque reduction is noticed with improvements in gingival inflammation and reduction in gingivitis. INDUSTRY NEWS Dr. Carl Gugino receives Dawson Academy Lifetime Achievement Award Great Lakes Dental Technologies (formerly Great Lakes Orthodontics) is pleased to congratulate its co-founder, Dr. Carl Gugino, for receiving the prestigious Dawson Academy Lifetime Achievement Award in recognition of his significant contributions to the dental profession. The award was presented at the January 2019 Dawson Airway Symposium in Saint Petersburg, Florida. Dr. Gugino graduated in 1953 from the University of Buffalo School of Dentistry. He established a local practice and eventually specialized in orthodontics in 1961. Dr. Gugino co-founded Great Lakes Orthodontics with Peter R. Breads in 1967. After years of expansion, the team eventually sold the company to its employees. Dr. Gugino currently serves as a member of the Great Lakes Dental Technologies Board of Directors and belongs to numerous American and European societies of orthodontists, has practiced orthodontics exclusively, and held lectures on this subject throughout the world. Dr. Gugino is the author of the next-generation Bioprogressive™ Philosophy, ZeroBase Orthodontics™, which combines treatment planning and diagnosis into time-efficient treatments. Dr. Gugino also developed the first computerized cephalometric and visual treatment objective program available in orthodontics, and his patient management and teaching philosophies are used by practicing orthodontists around the globe. For more information, visit greatlakesdentaltech.com. Carestream Dental expands its global leadership team Carestream Dental has welcomed Greg Marko as its new global chief marketing officer as part of its ongoing commitment to transforming dentistry, simplifying technology, and changing lives. In this role, Marko will drive global marketing strategy and product promotion across all Carestream Dental’s regions. Marko joins Carestream Dental with a robust healthcare/medical device background. Most recently, he served as a leader within Johnson & Johnson Vision. Previously, he was the vice president of marketing at National Vision and served as a marketing director for Asia-Pacific and North America at Transitions Optical in both Singapore and the United States. Marko is a graduate of Florida State University and the Masters of Leadership Strategies and Strategic Marketing programs (PPG with the Katz Graduate School of Business) and is fluent in both English and Hungarian. For more information, call 800-944-6365, or visit www. carestreamdental.com. 3Shape TRIOS® now integrated with 3M™ Clarity™ Aligners 3Shape TRIOS® users can now submit their digital scans to the 3M™ Oral Care Portal for treatment planning and delivery of its Clarity Aligners™. The portal integration enables professionals to cloud-send their 3Shape TRIOS intraoral scans with just a click to the Oral Care Portal. Clarity Aligners join the more than 50 orthodontic treatment solutions, sleep device providers, and 500-plus bracket libraries integrated with the 3Shape TRIOS intraoral scanner. Before sending 3Shape TRIOS intraoral scans to 3M for Clarity Aligner production, professionals can take advantage of the 3Shape TRIOS Treatment Simulator app to first excite their patients and promote acceptance of the proposed treatment. Using the app, professionals can show onscreen the envisioned results of the orthodontic treatment. 3M’s portal is web-based, HIPAA compliant, easily accessible from anywhere, and supports treatment for aligners, combination treatment, and retainers. Orthodontists using the 3M Oral Care Portal have access to its updated toolset, which displays 3-dimensional, cross-sectional views of the teeth, with and without overlays. Key to ensuring treatment success, the workflow further enables patient progress scans at each treatment step. These scans show how well the patient is tracking to the treatment, and they allow the orthodontist to refine a treatment plan if the patient isn’t tracking according to plan. For more information, visit 3shape.com/en/discover/orthodontist or 3M.com/ClarityAligners. G&H Orthodontics all smiles with announcement of John Voskuil as CEO G&H Orthodontics, provider of clinical solutions for the orthodontic community, announced the appointment of John Voskuil as Chief Executive Officer. He joins G&H with more than 20 years of experience delivering solutions to patients and doctors in the dental and orthodontics industry. Prior to G&H, Voskuil held a number of senior leadership positions at Dentsply Sirona and earned a Bachelor of Science in Industrial Technology Management from the University of Wisconsin-Platteville and an MBA from Northern Illinois University. For more information, visit GHOrthodontics.com.